It was another slow thrifting weekend for me. I did a little bit of flea market hunting on Sunday with my mom and neicelings and that was it! This is a good thing, it will give me time to get some other items priced for my new larger booth at the antique mall. I finally found a globe lamp! I intend to sell this one, but I love how they look set up with a shelf full of books. You already know I'm a sucker for an academic look. I think this globe might look even better with a blue-tinted light! Oh, I'm just a sucker for lamps in general. 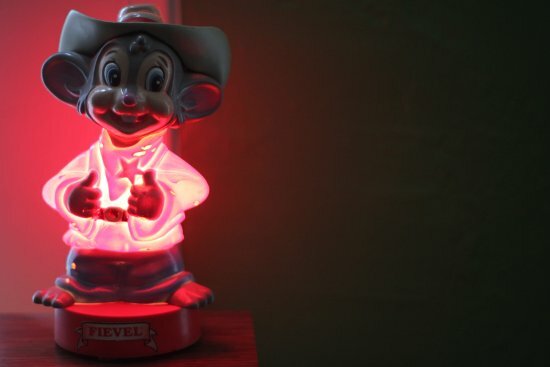 I really like this Fieval Goes West lamp. Who remembers that movie? It was ridiculous in the best ways. Another collector's item I intend to sell. Instead of thrifting, a lot of my time was spent sorting through a massive windfall of jewelry (mostly earrings) I received. These pieces fill two brown groceries bags to the top! I've been detagling, sorting, and setting these up to sell at the antique store. 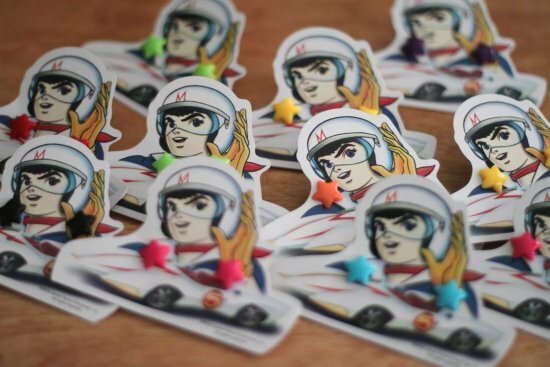 I love the pairing of the cute star earrings with the Speed Racer cards; and I love that I can sell all of these for cheap since they were free! To make up for the slow thrifitng the past couple of weeks I'm hitting up tons of thrifts with some friends next weekend. Uh oh, better clear the boxes out of the cars so there's plenty of space to thrift up a storm! 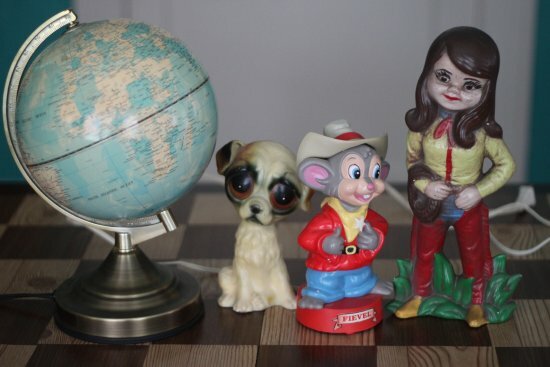 That big eyed dog figure is great! I would love to find one of those! Awesome globe! I always wanted one of those. Becky: I love finding big-eyed anything! Jackie: Me too, although this one is already sold. D'oh! I'll find another someday, I'm sure ;) And have a little while to enjoy it in the meantime. That girl "figurine" is cute. Karen: I like her too, very campy and unique. Definitely going to make some artwork inspired by her and the big-eyed dog! Wow:) The earrings and the cards together are really cute! that godzilla is awesome! i love finding fun things while thrifting! Blue Eyed Night Owl: Indeed! I think they would make the perfect Christmas gifts for friends. Yep, it's already time to start preparing for that. Flo: I sold it via Twitter, even though I kind-of wanted to keep it. I love those things! Next weekend's "Epic Thrift Adventure" shall be thoroughly documented- and I'll consume lots of coffee to make it though! Marcia: Thanks! Each find this week was pretty cute! fun finds! 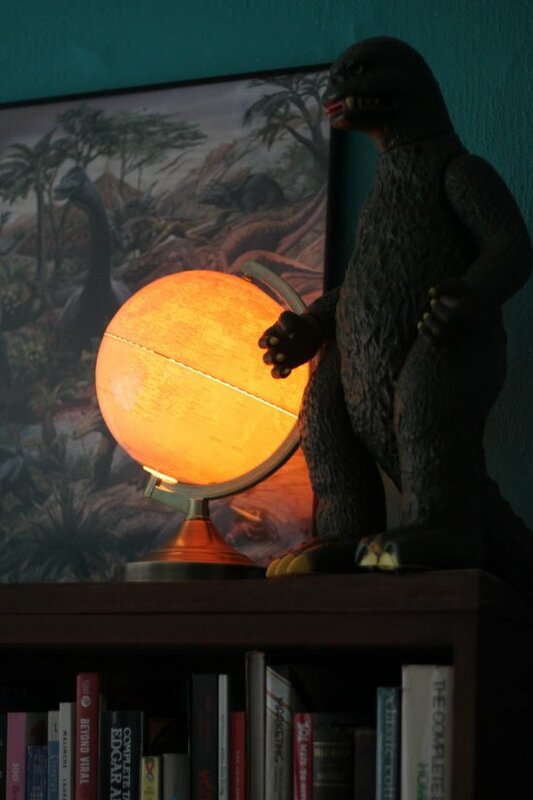 I want a vintage globe but they always seem to be too expensive, I have never seen a globe lamp, very cool! We went thrifting in Winter Park Friday and I finally found a printer's tray...it was on the floor, buried behind two pictures and a huge mirror...good thing the drawer handle was facing outward and my thrifty little eye spotted it. I also found a thrift store yesterday near our resort and may try to hit that up later today. Nothing like dragging the family out thrifting while we are on vacation! I can't wait to see your larger store space! Nells & Miss Lou: Now I'm a little sad that it's already sold, hopefully I'll find another soon! Lori: I remember you saying that, lucky lucky! A La Modern: You might have better luck carving your own first, haha! Good luck! Anna: You'll find a vintage globe one day, keep hunting! I don't encounter them so often, either. The globe light is brilliant! Love it!